Κτισμένο το 2016, το Sunsethouse-gilimeno αποτελεί ξεχωριστό σημείο σε Lombok, καθώς και έξυπνη επιλογή για τους ταξιδιώτες. Σε μια τοποθεσία μόλις 80 km από την συναρπαστική ζωή της πόλης, αυτό το 2 αστέρων ξενοδοχείο αποτελεί ένα εξαιρετικό μέρος και παρέχει εύκολη πρόσβαση στα μεγαλύτερα αξιοθέατα της πόλης. Με την βολική του τοποθεσία, το ξενοδοχείο προσφέρει εύκολη πρόσβαση στους προορισμούς της πόλης που πρέπει οπωσδήποτε να δείτε. Με τις υψηλού επιπέδου υπηρεσίες και την μεγάλη ποικιλία ανέσεων, το Sunsethouse-gilimeno δεσμεύεται ότι η διαμονή σας θα είναι όσο πιο άνετη γίνεται. Τα δωρεάν WiFi σε όλα τα δωμάτια, 24ωρη φύλαξη, ημερήσιος καθαρισμός, φύλαξη αποσκευών, ασύρματη σύνδεση Wi-Fi σε δημόσιους χώρους είναι μόνο λίγες από τις εγκαταστάσεις που κάνουν το Sunsethouse-gilimeno να ξεχωρίζει από τα άλλα ξενοδοχεία στην πόλη. Οι πελάτες μπορούν να επιλέξουν από 10 δωμάτια καθώς όλα διαθέτουν μια ατμόσφαιρα απόλυτης αρμονίας και γαλήνης. Το ξενοδοχείο προσφέρει φανταστικές εγκαταστάσεις, συμπεριλαμβανομένων των πλοία, σνόρκελινγκ, ιδιωτική παραλία, εξωτερική πισίνα, για να σας βοηθήσουν να χαλαρώσετε μετά από μια γεμάτη δράση μέρα στην πόλη. Έξοχες υπηρεσίες και μια εξαιρετική τοποθεσία κάνουν το Sunsethouse-gilimeno την ιδανική βάση από όπου θα απολαύσετε την παραμονή σας στη Lombok. pool,staff,room condition was veryyy good. Great location, close to good snorkeling. Staff was very friendly. Worth the money. It is located at west side of the island, which makes it a great place for sunset appreciation. However, the boat (particularly public boat) stops at east side of the island. Around, if not at least a 15 minutes walk on sandy path under the sun is needed to reach the property. (You can always hire a cidomo but we decided not to spend on it.) The walk might be more unbearable if you reach Gili Meno in the afternoon as the sun might be a blaze. Nevertheless, the stay was a lovely one. The room overlooking the sea and horizon was super clean and smells really pleasant. They even installed air freshener in the bathroom which was very much appreciated by us. We had a great two night stay in Sunsethouse. We were searching for something different and quiet for our vacation on Gili Meno and this popped out and it was satisfactory. Quite a distance from the pier, it is highly recommended to hire a horse carriage to take you to the resort. Food was a little expensive (maybe it's because of the limited resources they have on the island, can't really blame them) and the signal was quite slow. But this is a great place to really get away from everything, it was so serene and peaceful, and of course a romantic spot for couples (let me count... there were 13 couples kissing at the beach throughout our stay, beautiful!). The beach however isn't as good as the eastern part of the island, there is nothing you can do except building sand castles (not the finest sand) and collecting seashells. Swimming is not recommended as dead corals and pointy rocks are plenty in the shallows (I did swim there and totally regretted it as I tried to make my way back to the shore), but a great spot for tide pools when the water subsides (we saw so many creatures : mantis shrimp, starfish, crabs and even an octopus!). Would recommend this resort for again, a total get away from the everyday stress and routine and couples. it's clean and staff are helpful.you can see the amazing sunset at the beach here! Pro: - Nice location with a fantastic view. Perfect place for watching the sunset from the beach. - The surroundings of the hotel is quiet, and we didn't hear any noise from Gili Trawangan. - The room was clean, and big enough for two people. - Nice friendly, and absolutely helpful staff. - Swimming pool is great. - The food is really tasty. - The bungalows on the beach are perfect for relaxing and protect from the sunshine. - Wifi is available in the rooms, and even on the beach. Contra: - Fridge is missing from the rooms. - The food is not the cheapest. - The public boat harbor is quite far away from the hotel. (at least 15 min on foot, which can be hard with baggages in the sandy road.) For information: Be aware of the strong sea current specially at high tide! We stayed here in the hope that it would be super lovely. It was clean, bed was comfortable and it was right on the beach, but it lacked personality. The rooms are pretty basic for the asking price - no fridge and tiny bathroom. If they lowered the price then they lower the expectation and would get better reviews. I would recommend this hotel to friends if the price was lower. It's far from the port for walking. But quiet and clean, good for relax. We would definatley recommend this hotel to anybody, excellent staff who are ready to help any second of the day. The hotel is in a good location on a nice beach, pool is nice and clean, rooms are clean and have flatscreen tv. A few restaurants within walking distance (but take a torch) we had a really nice relaxing stay with our daughter who met us there from Australia. The only construction critism about this hotel is no fridge in the room, and would be nice to have tea/coffee facilities in the room but overall fantastic. Sunsethouse is a very new modern hotel with an excellent pool. We stayed here with our 2 and 5 year olds and they loved it. 200-400m walk in either direction for nice snorkelling and sandy beach. We enjoyed exploring the quiet west side for casual sunset beach dinners and also a short walk to the multiple options on the east side. Very friendly staff. Basic & clean brand new (hostel?). Wonderful staff but really basic accommodation. Very few rooms so good for scaping the masses. Great location, Beautiful Sunsets, The staff is very friendly and helpful. A wonderful quiet place with a huge pool. I would for sure stay there again. Place is really quite and staff was very pleasent and services. Very good snorkling in front of the hotel. Nice beach and big swimmingpool that is even open in the evening. A bit further away from most restaurants. We wished we stayed here longer it was amazing. Staff are the best and food is great. The view and rooms are perfect. I look forward to returning. Lived everything about this place. Staff great, lovely beach. Loved the pool and accommodation fantastic. Location is a distance from harbor, 5-10minutes of cidomo (horse-drawn carriage). Walking may take 15-20minutes. 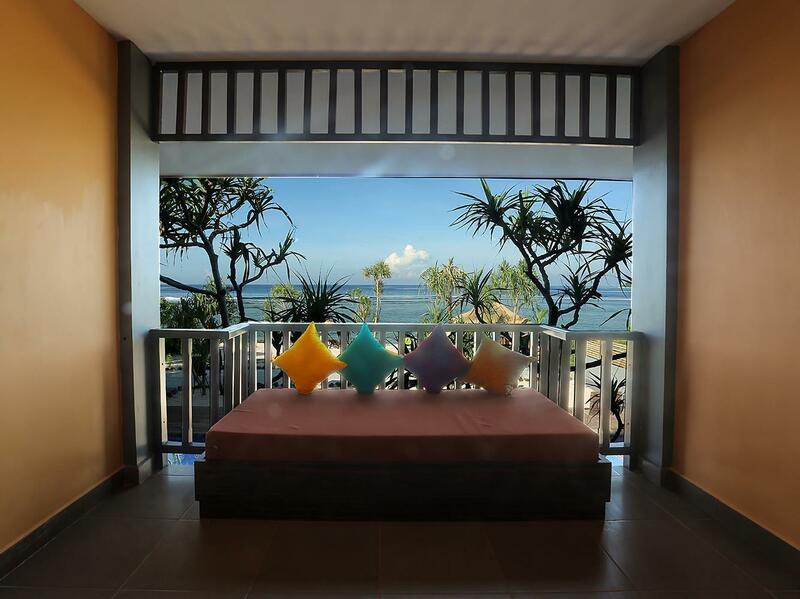 Unspoiled beaches, sea-viewing swimming pools, scenery of Gili Trawangan night life . Friendly and helpful staff. Room is clean and comfort. We had a splendid stay at this hotel. Definitely will stay again.